Easter is one of our favourite times of the year. 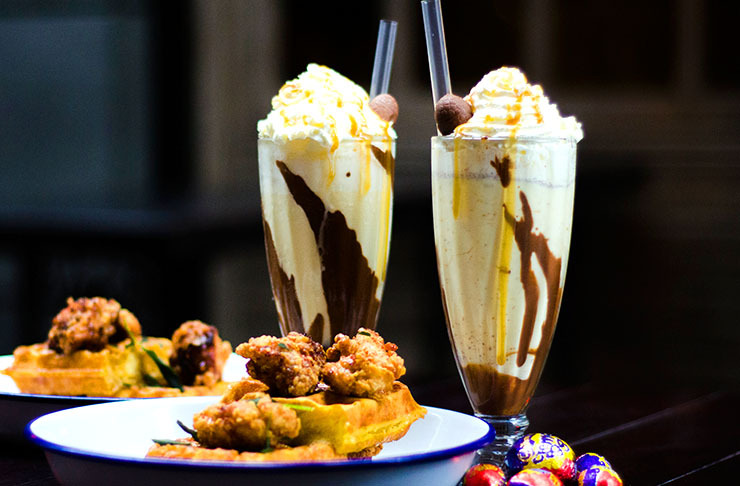 Not only do we get treated to a long weekend but our favourite food joints use this as an opportunity to come up with some of the most deeeelish creations to get us in the Easter holiday mood. We’re talking more than just chocolates and hot cross buns as people have been going to new heights this year. Here’s where you can find crazy delicious Easter treats this year. 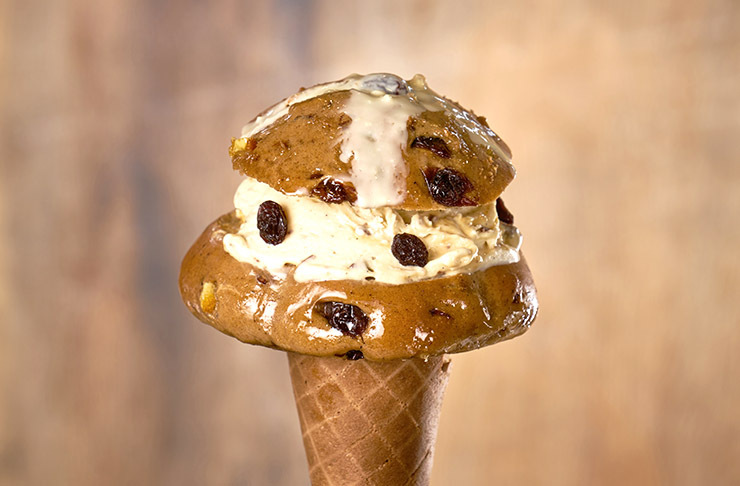 Part cone and part traditional bun, the Hot Cross Bun Ice Cream one of a kind. The bun is sliced in half, served warm with the bottom half fitting perfectly around the crispy waffle cone. Choose your favourite flavour of gelato and they’ll sandwich it in between the toasty warm hot cross bun by using the other half as the lid to this masterpiece. Giapo have soaked their raisins in orange juice to make it as sweet and moist as possible and added notes of candied orange to their spice mix to makes these babies extra special. Jordan Rondel from The Caker has brought back the infamous hot cross bun cake for another round this year! After being so successful last Easter, it would’ve been devastating not be able to get the chance to taste this creation again. The cake is filled with sultanas, chunks of chocolate and candied orange. To elevate the flavours, it’s topped with cinnamon cream cheese icing, Valrhona chocolate pearls, freeze-dried blackcurrant slices, hazelnut praline crunch and chocolate ganache. Does that sound heavenly or what? Another classic Easter treat is the infamous Crème Egg and Moustache have taken this to the next level. 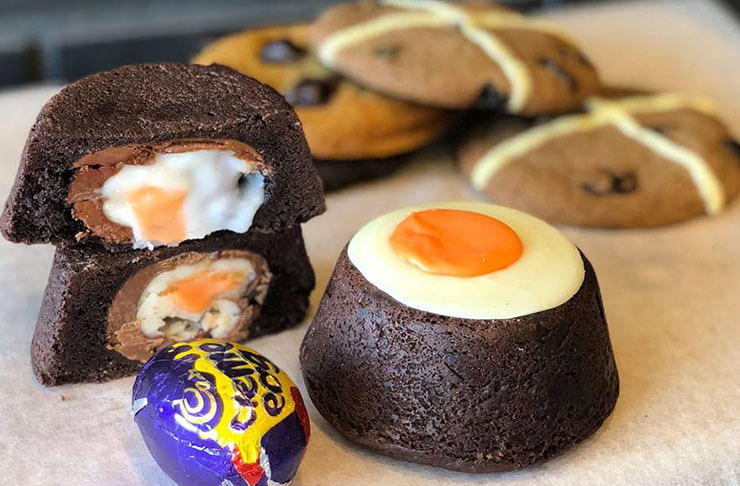 Inside their moreish chocolate fudge cookie, they have decided to fill it with a whole Crème Egg to create the most indulgent Easter treat. Moustache didn’t just stop there as they also released a hot cross bun cookie which is lined with icing on top of a cookie with notes of spice and cinnamon. These are available on their online store and their shop on K’Road for a limited time only! Speaking of Crème Eggs, did you guys hear about Orleans Crème Egg Milkshake?! Imagine the Easter treat in cold, chunky liquid form topped off with whipped cream, caramel drizzle and garnished with another whole Crème Egg to make it even more extra! Okay, we know we said to think beyond hot cross buns but these are too good to not mention. Ima Cuisine have put their own twist on the classic Easter treat and outdid themselves by adding a rich custard on top of the bun as the icing. Who knew this small alteration could make a world of a difference as these hot cross buns are some of the tastiest things we’ve ever tasted and have earned the rep amongst Aucklanders for doing the best hot cross buns in town. For all the health nuts and vegans out there, you don’t have to miss out this Easter as our friends at Little Bird Organics have come out with a range of Easter goodies! Some of these include a spiced carrot cake, raw caramel and cream Easter nests, raw cross buns and more. Don’t let the health factor get you thinking these lack in flavour as these babies are so rich, indulgent and delicious. You can get these healthy treats online, get in there quick as these sell out fast. Miann impresses us every year with their Easter treats, and this year is no exception. They’re back with their buns, eggs that look like pieces of art and cute cakes and macarons. After having mastered the modern art of chocolate hot cross buns, they have elevated things by giving us the choice of adding our favourite flavour of their special gelatos. The toasted hot cross bun melts the gelato to the perfect, creamy texture and it’s something that is not to be missed this Easter. Get the perfect Easter breakfast at Billy Café with their coconut bread French toast, topped with a ooey gooey Crème Egg and paired with salty bacon. The sweetness of the toast and Crème egg is balanced with the savoury elements of the bacon to avoid the sudden rush of sugar and get you through the dish till the end. Only available for a limited time, get in there now! You haven’t had chocolates until you’ve had a taste of these babies. Valrhona has been producing the best chocolates in France since 1922 and Sabato have managed to get their hands on these rare goodies this Easter. These chocolates are the best of the best when it comes to your Easter chocolate fix! Out of the huge range Sabato has for us, our fave would be the chocolate family as they are filled with salted caramel ganache and are just so rich and moreish. Our favourite waffle truck Eggloo have some amazing treats in store for us this Easter and we just can’t contain or excitement. Our favourite Easter creation from this place would have to be the Spiced Carrot Cake Waffle. The waffle batter has notes of spices, topped with carrot cake and filled with cream cheese icing. If you’re more of a fruity person, Eggloo are also whipping up a coconut mango waffle topped with a bunny macaron! Auckland’s freakshake hub were bound to live up to their reputation and do something epic this Easter and boy, have they delivered?! Crunch Tower Desserts have created an Easter special where you pick a milkshake flavour of your choice and they add everything Easter on to it. We’re talking a chocolate bunny, M&M speckled eggs, hot cross bun, Cadbury eggs, Easter mallows and more.